Skis? Snowshoes? Fuzzy boots? Check, check and check – looks like it's time to hit the road for Sundance Estates. A few hours' drive from Vancouver, Sundance Estates is an upscale residential community amid the slopes of Sun Peaks Resort. A major year-round destination in the scenic Thompson-Nicola Regional District, Sun Peaks offers plenty of outdoor recreation, from skiing to mountain biking. No matter what kind of vacation you're looking for, you can find plenty of Sundance Estates vacation rentals with amenities like hot tubs, fireplaces, ski storage or sundecks. You can find winter sports aplenty near Sundance Estates. The surrounding Sun Peaks Resort boasts more than 1,700 hectares of skiing space with 135 runs for skiers of all levels, and you can also enjoy snowtubing, showshoeing and pretty much any other sport that begins with "snow". During the summer, the resort offers hiking trails and a mountain bike park. At the 18-hole golf course – which just happens to be the highest-elevation course in British Columbia – you can admire your nice, clean drive against striking views of the surrounding mountain landscape. Sundance Estates has a humid continental climate, with warm summers, cold, snowy winters, and regular rainfall throughout the year. Summer highs peak around 20 degrees in July, while spring and autumn are generally cooler and wet. Winter temperatures can hover below freezing for weeks at a time, and the area gets more than 500 cm of snow every year. Although the surrounding Sun Peaks Resort offers outdoor activities all year round, winter is the busiest time of year in the area, and you'll have the best luck scoring killer deals on Sundance Estates vacation rentals during the slower summer months. 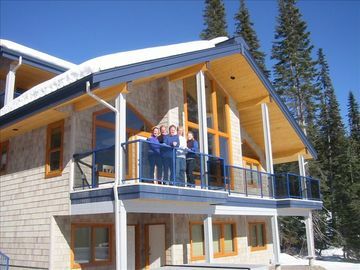 Sundance Estates lies amid the mountain peaks of the Sun Peaks Resort within the scenic, sprawling Thompson-Nicola Regional District. The area features plenty of wooded mountainsides and rocky peaks, as well as high-altitude meadows and grassy plains. There are several rivers and lakes in the region, and the nearby Glacier National Park is home to unique sights like glaciers, caves and waterfalls; it also provides habitat for local species like grizzly bears, cougars and wolverines. Whatever your preference, you'll find plenty of Sundance Estates vacation rentals offering epic views of the area's stunning scenery. Where to stay near Sundance Estates? Our 2019 accommodation listings offer a large selection of 233 holiday rentals near Sundance Estates. From 15 Houses to 127 Condos/Apartments, find unique holiday homes for you to enjoy a memorable holiday or a weekend with your family and friends. The best place to stay near Sundance Estates is on HomeAway. Can I rent Houses in Sundance Estates? Can I find a holiday accommodation with pool in Sundance Estates? Yes, you can select your preferred holiday accommodation with pool among our 19 holiday homes with pool available in Sundance Estates. Please use our search bar to access the selection of holiday rentals available.